As part of supporting Rockwell Collins’ ISO-14001 team, I helped setup a tour of the local landfill for employees. 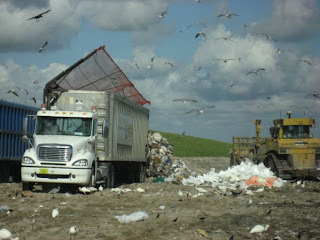 If you’ve never been to a landfill, you need to go. It will inspire you to do way more recycling than you do now! Most of them will give you free tours, since they realize the importance of public education. In fact, take the whole family, and you’ll see how quickly you can change their behavior! On the downside, it was pretty depressing to see all the trucks constantly dump loads of waste all day long. One after another. The worst part is that many of the items being dumped could have been recycled (cardboard, wood, fabric, plastic bottles and jugs, paper, etc). But once it leaves the truck, it’s against the law to grab the item (for safety reasons), so we saw piles of items that you wanted to go grab and place in the recycling bins, but we couldn’t. If I ran the landfill, I would require every truck to empty its contents, and sort out the recyclable items from the waste, before it ever goes up to the hill. Why do we expect the citizens to know all the rules? Why would they blindly allow people to dump items without any inspection or checks? With the constant updates in what can and cannot be recycled (which also seems to be unclear whomever I ask), educating the public will always be way too costly and too much “after the fact” to make any immediate impact. Spend that money and effort at the last line of defense, and use that information to flow back to the truck drivers and citizens with hard facts. I realize there would be a lot of extra labor involved, but what about the cost of land for burying stuff we don’t need to throw away, and having to buy more land a lot sooner, as a result of this lack of “inspection”. If you consider any recyclable item that is dumped as an error or “escape”, then common thought is that you go to the prior step and setup an inspection, until you eventually trace back to the source of the “error”. Yes, public education is the ultimate scenario we should strive for, where no one throws away anything unless it cannot be recycled. In the meantime, you should manually sort out what doesn’t belong until that time comes. That brings me to the really depressing part. Once an item is dumped, it gets covered and all liquid is eventually extracted from underneath the trash. 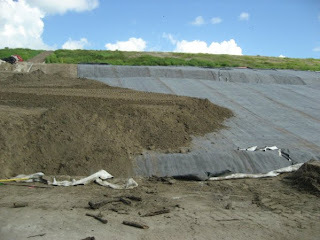 The hill is covered in a layer of material that prevents any moisture from entering. Basically, it’s sealed up tight, and nothing gets in or out. This is a problem because nothing will degrade or compost in those conditions. Biodegradable materials require water, heat and oxygen in order to break down, which they will not get inside the landfill (at least not enough before its covered forever). BOTTOM LINE: Don’t bother buying biodegradable materials unless you are going to compost them yourselves, or take them somewhere that will compost them for you (which is rare to find for most people)! "Environmental sustainability or 'Green' efforts make business sense because they focus on the efficient use of resources, which has a positive and salutary effect on an organization's finances."